Having struggled with the smaller faux fur bear I’d tried making before Christmas (that one is currently in my “semi-abandoned” bag), I wanted to give the Delight pattern a go. This pattern is designed for faux fur or a non-pile fabric, so I thought it might work in fleece as a trial run. 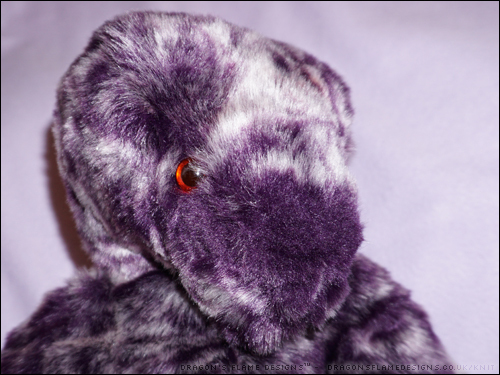 Given that the fleece Delight was a success, I cut the pattern pieces from some very tactile purple faux fur. This fur is considerably thicker than the fleece, so I trimmed the fur in the seam allowance to make it a bit easier for my sewing machine to handle. 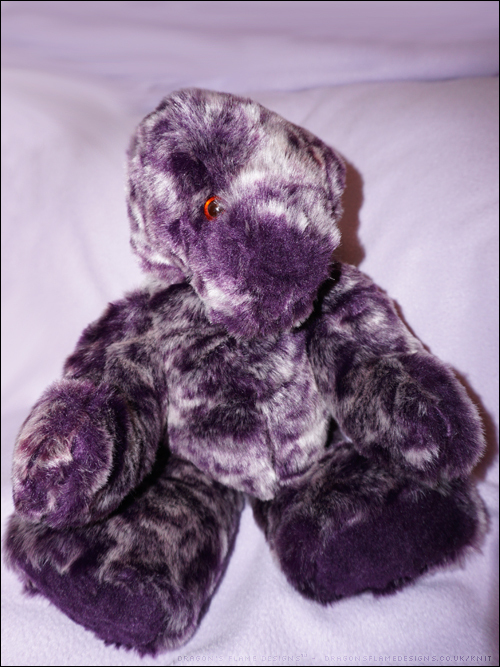 The bear’s limbs are sewn into the body rather than being jointed, which means they’re firmly attached! I did use a toy joint for the head, as I found it quite challenging to line up the seam accurate in order to sew it directly onto the body. Normally I’d use toy stuffing with some plastic pellets to give the bear weight, but I had some bean bag filling in the cupboard, and thought it could be interesting to try that out instead. It was a nightmare to stuff into the bear, as the filling not only has a has a static cling but also doesn’t compress when you try pushing down on it, so it ended up everywhere (including all over the floor at one point)! But it has given Delight a lovely crinkly sound when you squeeze his paws, and he is actually quite ‘squishable’ which is a bonus too. As you can see, Delight isn’t quite finished yet – he still needs his ears, and a nose & mouth; those are the features which really give the bear character…. and are also the parts which I find the most challenging, as if the ears or mouth are slightly lopsided it really looks odd! This entry was posted in Plush, Sewing, Uncategorized and tagged delight, Emmas Bears, fake fur, faux fur, plush, sewing, UFO on January 30, 2018 by Sewist. Whenever I’ve tried making a bear out of a non-pile fabric, they haven’t come out looking quite ‘right’. 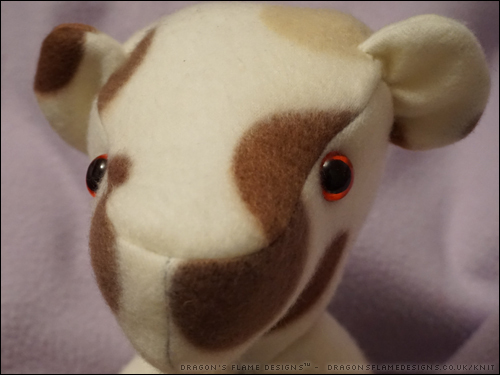 Usually it’s the head or muzzle that just seems to be the wrong shape compared to the faux fur example picture. 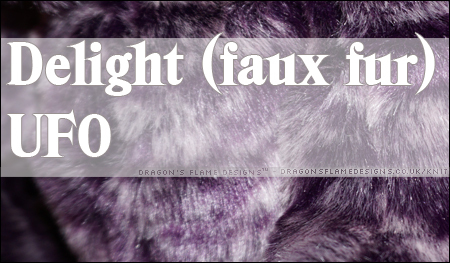 Delight, however is specifically designed for faux for or calico, so the head shape should look perfect regardless of the fabric I use. I decided to test it out with some remnants of a fleece blanket (the same one I used for the reindeer a couple of years ago) and made Delight entirely unjointed. The head was a struggle to align, so I think Delight would benefit from a scarf or ribbon just to cover up the shoddy stitching! I used a combination of plastic pellets and toy stuffing to make Delight as cuddly as he looks. 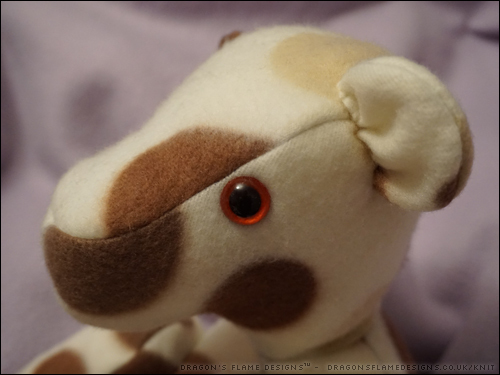 You may notice that he’s missing a nose and mouth – that was done on purpose, as I felt that the stitching would detract from the spotty details of the fleece ….that’s my excuse, and I’m sticking to it! I do love the overall look – it’s a much better head shape than the other patterns I’ve tried before. I think the next Delight I make will be in faux fur, but as Delight is designed as a signature bear maybe it would also work to have a calico version which has an embroidered design on it (or if that fails, just a hand drawn design instead!). And yes I admit I used a darker thread than was advisable with such a light coloured fleece! 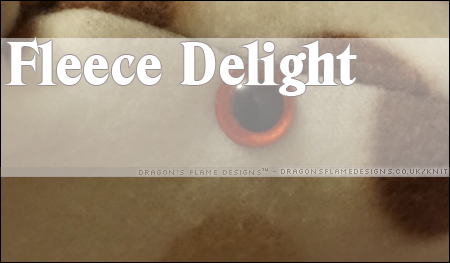 This entry was posted in Plush, Sewing, Uncategorized and tagged bear, delight, Emmas Bears, fleece, plush, sewing, toy on January 23, 2018 by Sewist. I’ve made several card holders before, but they’ve either not had a closure, or relied on either velcro or a button and hair elastic to hold them closed. 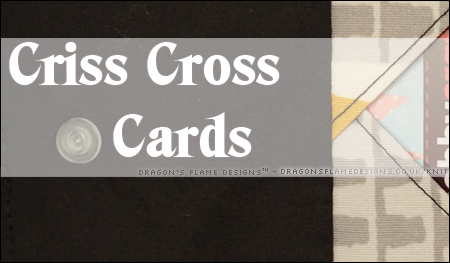 After a friend mentioned how easy she was finding poppers to install into sewn items, I thought it was time I tried them out; and as luck would have it, I also came across the pattern for these Criss Cross Card Holders. Although I haven’t made any ‘real’ new year’s resolutions, I do want to try and use up some of my fabric offcuts, so the triangular sections on these card holders might be the ideal use for some smaller offcuts. 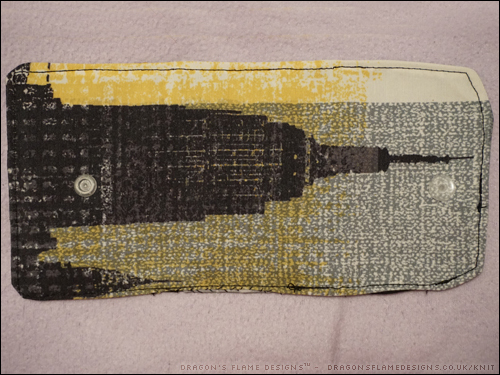 As a first attempt at the pattern, I used some of the ‘Skyline’ canvas-type fabric I had previously made a bag and notebook holder from. It took a little while to get the placement right to make sure the skyscraper was visible…. then I realised that once the card holder was folded, the top of the skyscraper would actually be upside down (whoops!). But it is perfectly functional as a card holder. The only thing I found which I wanted to change, was the card sections being a little too wide. I had a feeling that the cards might slide out a little too easily from that, so I decided to try making a second card holder that might be a little more suitable. 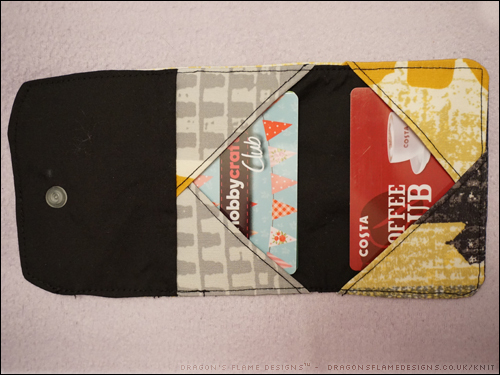 This fabric came from Hobbycraft last year – I’ve been waiting for the ‘perfect’ project to use it, and what better than a little card holder? I didn’t quite line up the popper perfectly, hence the slightly wonky front, but it’s still usable. 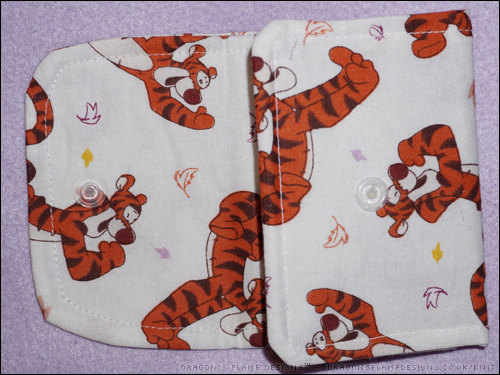 I increased the seam allowance when sewing the front and back together, and also increased the top stitching to 1/4″ which holds the cards in much tighter. 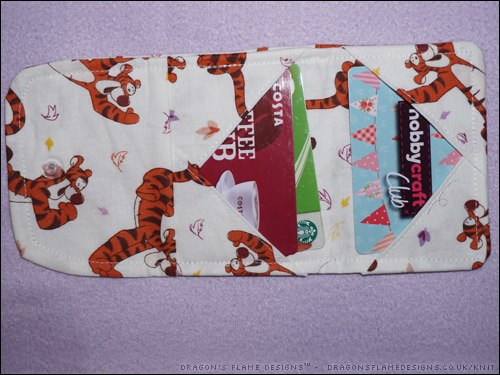 I’ve made some notes on the pattern so I know what alterations I need to make for future card holders. This entry was posted in Bags, Sewing and tagged card holder, fat quarters, poppers, sewing, wallet on January 16, 2018 by Sewist. A new year always seems to make people want to tidy up, and once I’d taken my Christmas tree down I realised that the table it had been on, could do with a little sorting out. The worst culprits for making it look a total mess, were the bundle of charger leads draped over a letter rack. 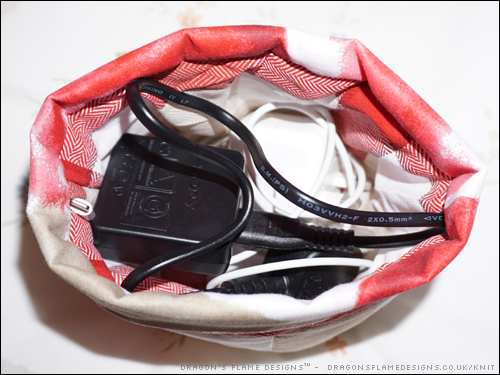 The chargers get used too frequently to justify them being tucked away in a cupboard, so I felt the next best thing would be to make a little fabric basket to keep them tidy while still being accessible. 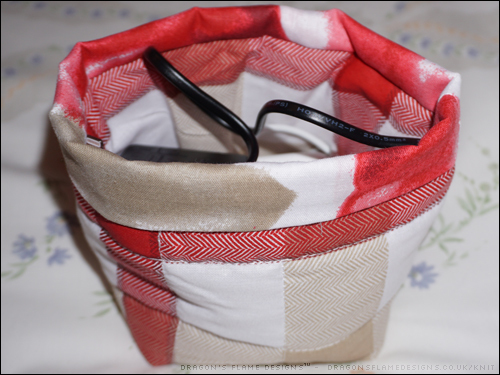 The pattern actually makes three baskets, but I only wanted to make one in this particular size (and wanted an excuse to use up some of my larger fabric scraps). I did make it slightly shorter than the pattern, simply because the fabric I was going to use for the cuff wasn’t quite long enough otherwise! 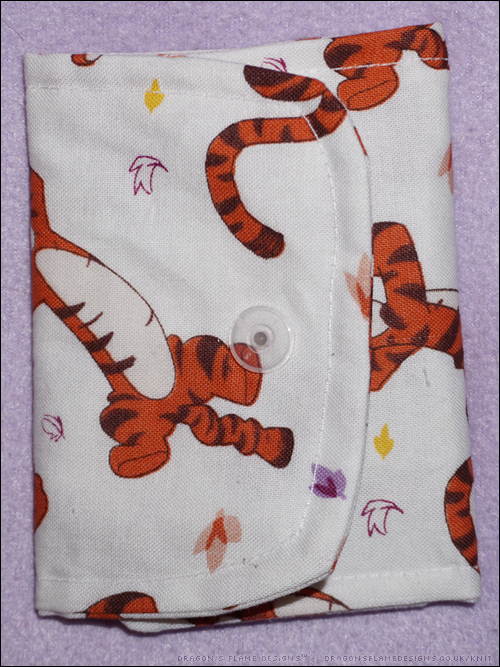 The fabric was actually part of a duvet cover I’d used as a ‘wearable muslin’ for a dress pattern previously – the main pattern was one side, and the cuff was the reverse design. To quilt the basket, I simply stitched down some of the edges of the boxes. I don’t (yet) have a darning foot for my machine, so I decided that free-motion quilting was going to be a bit beyond my skills at the moment! 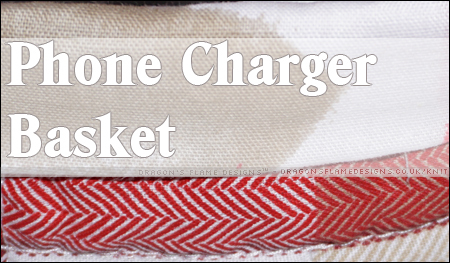 As you can see, two chargers fit perfectly into the basket, and if I make a couple more baskets for my relatives’ phone chargers too, there should be a lot less chance of getting in a muddle with which charger is for which device! 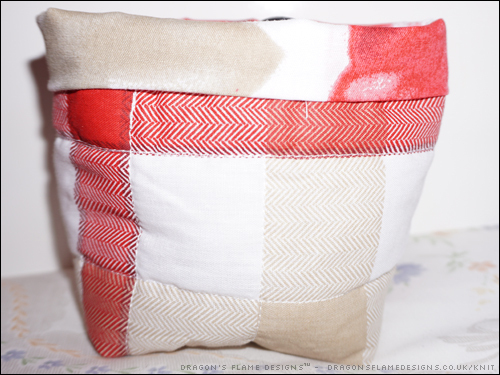 This entry was posted in Everything else!, Sewing and tagged basket, sewing, storage on January 9, 2018 by Sewist. Most years I’ve set out my New Years Resolutions, and a lot of the time I can’t keep them past March. So when I decided to plan ahead for 2018, I took the idea from a “9 things” post on Instagram last month to make my Nine Things to try in 2018. I’m hoping this will make a change from trying to find jersey to make t-shirts, and give me a more varied selection of tops suitable for the spring and summer. I was drawn to the Zen Pants as there are so many rise variations included – I tend to wear medium waist trousers, but I usually wear them a bit lower than they’re designed, so the medium rise of these might work brilliantly. It’s also the first pattern I have that recommends using Ponte fabric, so that will be an interesting experiment! I was planning on making the Marigold last summer, but time ran away without me and it was winter before I looked at the pattern again. But maybe this year I will get one made! I really dislike sewing buttonholes, so you might be wondering why I have a Novelista button-up shirt on my list…. well, either I’m going to cheat and use poppers, or I’ll add in a hidden button placket so you get a neat front without the stress of ensuring all those buttonholes are perfect. Back when I started trying to sew clothing, I hadn’t read the information that said “jackets are hard to make” so naturally I made myself a few blazer-type jackets from duvet cover fabric. Other than one collar being put on the wrong way around, they came out surprisingly well! So I decided I really should make myself a decent blazer this year, out of some fancier fabric than a simple duvet cover. 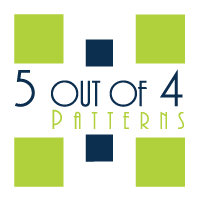 This pattern uses woven fabric, so there should be a great selection available in my local fabric shop. On to the bats, and I admit I have made a few of these bats before! But when I was sorting out my bag of fabric last month, I came across some spare black and blue plush fabric which is just calling out to be made into a bat or two (or maybe three!). Because the wings and inner ears are made from woven cotton fabric, it’s a great pattern to use up oddments, or to so slightly crazy with glow-in-the-dark fabric like I did for the latest two bats I made. Another top, but it’s not quite what you’re thinking – the Refined Raglan is made from woven fabric, not jersey! It includes details on how to alter the pattern to fit your individual shape, so it should be more successful than some of the previous woven tops I’d tried making – those never quite fitted ‘right’. 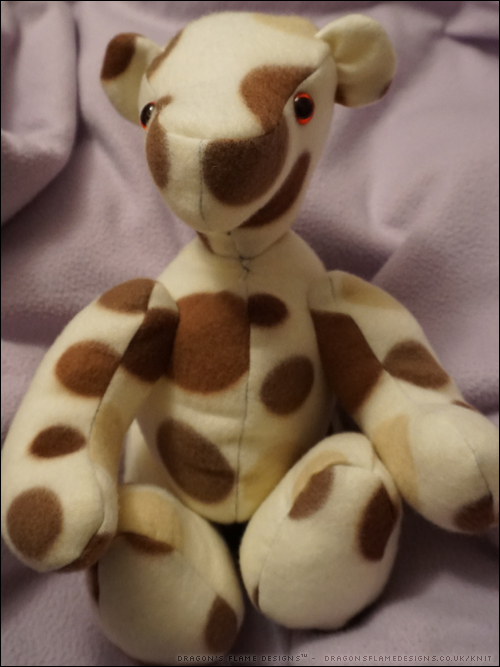 On the theme of plushies, I’ve been wanting to make a Willa Bear for a while, but haven’t managed to get to grips with adding in non-jointed limbs…. hopefully this year I’ll find enough patience to sew them on, without arguing (too much) with my sewing machine! 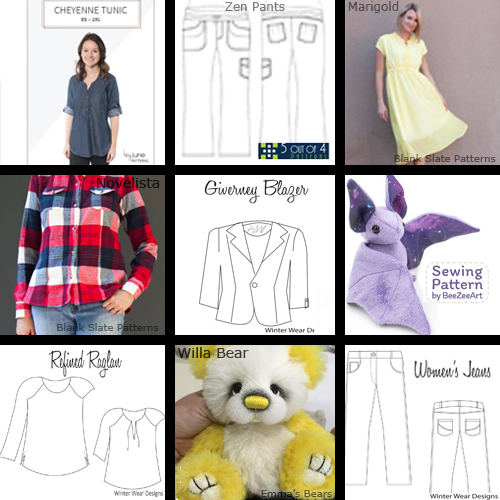 The thought of sewing jeans is quite scary to be honest, but if I can get to grips with some of the other patterns, then maybe (just maybe) I’ll hunt down some stretchy denim and try making some jeans! As with the other Winter Wear Designs patterns, the Real Deal Jeans have a section on getting the perfect fit, with the relevant pattern alterations you need for each fitting problem. So there it is, my 9 things to try in 2018…. but it remains to be seen if I manage to make any of them this year! If I don’t, it’s no big deal, but I thought having an aim at the start of the year might help focus my attention a little! This entry was posted in Clothing, Inspiration, Plush, Sewing and tagged inspiration, new year, nine to try in 2018, sewing on January 2, 2018 by Sewist. Hi, I'm Paddy. Welcome to my little world of sewing and crafts. I'm known for having multiple UFOs (UnFinished Objects), but I'll finish them one day! 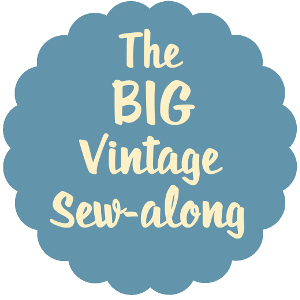 I started sewing in 2014 and soon realised it was much quicker to finish a sewing project than a knitting or crochet one. I'm still a novice when it comes to the detailed fit of trousers and dresses, but I have a steadily increasing pile of finished clothing which actually fits! 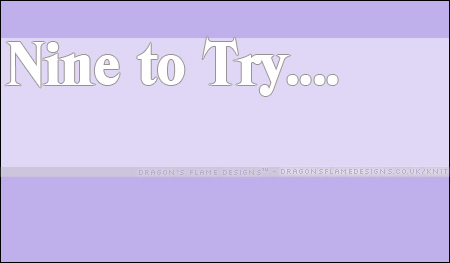 Feel free to wander around - if you want to find something specific (like clothing, or tutorials maybe), then just hover over "sewing" in the top menu, and click the relevant option from the drop-down menu. 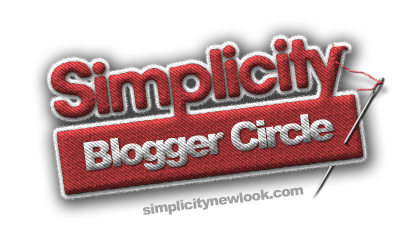 If you click through an affiliate link and make a purchase, I get a small payment. It doesn't cost you any extra, and simply helps fund my next purchase of fabric!